Allison's new book will help women who have allowed others to overstep their boundaries, whether it's a spouse, an adult child, a boss, a parent, a neighbor or a friend. Setting Boundaries� For Women is designed to inspire, empower, and equip women with the tools to transform lives. 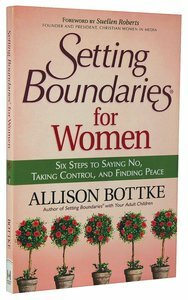 About "Setting Boundaries For Women"
Allison Bottke is an inspirational speaker at conferences nationwide. Making appearances on radio and television programs, she has written articles for several nationally known magazines. She is the creative force behind the God Allows U-Turns books and co-author of I Can't Do It All! and the author of the recent One Little Secret with Tracie Peterson and Dianne O'Brian.A conservative Christian who spent her first 35 years as a nonbeliever, her personal U-Turn story has been seen on The 700 Club, heard on Decision Today radio, and broadcasted in many other television, radio, and news media. Allison and her husband make their home in southern Minnesota.